This section of our website has been created to help promote GIS & geomatics related job opportunities in Nova Scotia. Members and corporate sponsors have been provided the ability to post any GIS or geomatics related jobs that they wish to share with the geospatial community. To include the job posting information on your own website or RSS reader simply use the RSS feed button below. To expand the content, simply click on the article title, click the blue arrow located after the title or click the Read more link. 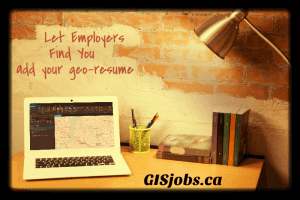 To add a GIS or geomatics related job posting or a link to a job posting on another website simply click the 'add post' button below and enter your job posting details in the appropriate boxes that appear. [Note: you must be logged-in to your GANS member account to post information below, so if you do not see a button then you may not be logged-in]. This is an exciting opportunity to advance your professional development through hands on experience, training, and mentorship from highly qualified professionals. The skills and experiences you will gain through this opportunity are invaluable and will last a lifetime! Candidates must provide proof of status as a full-time student and be scheduled to return to an accredited post-secondary institution in the fall of 2018 (or the next applicable semester for the education program) to be eligible for this program. The student will be assisting the department’s TIR GIS group with the building, maintaining, and distribution of the geographically referenced asset information. Candidates must be motivated, self-starters who can work with minimum supervision. There are several major projects that are currently ongoing in the group and the successful candidate will find themselves involved accordingly. This position is based in the Sydney District Office and Port Hakesbury Area Office, but will require field work in Cape Breton, Antigonish, Guysborough, Inverness, Richmond, and Victoria Counties and may be required to provide support in other counties throughout the province. We are now accepting applications for our summer student program. This is an exciting opportunity to advance your professional development through hands on experience, training, and mentorship from highly qualified professionals. The skills and experiences you will gain through this opportunity are invaluable and will last a lifetime! Students will be assisting the department’s TIR GIS group with the building, maintaining, and distribution of the geographically referenced asset information. Candidates must be motivated, self-starters who can work with minimum supervision. There are several major projects that are currently ongoing in the group and the successful candidate will find themselves involved accordingly. This position is based in the Bedford District Office, but will require field work in Hants and Halifax Counties and may be required to provide support in other counties throughout the province. •Be recognized as having full-time student status by the post-secondary academic institution at which you are currently enrolled (proof will be required). •Be the minimum age to work in the province or territory where the job is located. Blue Jack Consulting are looking for some REALLY SMART people who are interested in LONG TERM employment. they offer a great compensation package- including medical and dental, professional development credits, and a few other fringe benefits we think you might like! 1. Attend Board meetings and assist the Secretary with his / her role during meetings. 2. Carry out the directions of the Board including planning events, communicating with members and supporting the committee’s. 3. Update the Association’s communication channels on a regular basis. To do so, the Administrative Coordinator must have awareness of the current events within the local geomatics community; especially association members. 4. Promote and support participation by volunteers in all areas of the organization's work, especially through committees. 5. Maintain official financial and administrative records and documents, and ensure compliance with provincial regulations. 6. Coordinate all Association events, unless otherwise directed by the Board. In this responsibility, he / she must coordinate a specific number of events annually as set by the Board. 7. Work with the Treasurer to prepare yearly budgets and provide regular budget updates to the Association’s Treasurer. - Strong background in events planning and communications. - Ability to organize and prioritize tasks independently. - Working knowledge of bookkeeping and accounting. - Familiarity with the geomatics industry would be an asset. Additional hours can be expected at times when extra support is required for specific events and projects. It is not expected that the Administrative Coordinator position requires a set office; a home office would suffice. GANS Board meetings take place on the first Wednesday of each month from 3-5pm at the ESRI office in Bedford, Nova Scotia. Please note we will only be contacting those applicants we wish to interview for the job. Eagle is currently seeking a Technical GIS Specialist will work on behalf of the Project Management Office (PMO) and with the project team to complete deliverables and tasks necessary to advance enhanced capability within the Situational Awareness solution. This is a two (2) month contract, scheduled to begin immediately in Halifax NS. Familiarity with working in Emergency Services (Fire, Police, EMO). Don’t miss out on this excellent career opportunity, Give us a call now @ 1-800-281-2339 and quote Job ID# 52903 or apply online today! Are you experienced in the use and application of GIS technology in a municipal water, wastewater and stormwater utility? Have you demonstrated your supervisory ability through excellent leadership, motivation and interpersonal skills? Are you interested in discovering innovative solutions while leading the application of both traditional and new GIS technologies? Are you interested in having the opportunity to contribute to the Engineering and Information Services department at Halifax Water? If so, this may be the opportunity for you! With a mandate to provide world class services for our customers and our environment, Halifax Water is Canada’s first regulated water, wastewater and stormwater utility serving a population of about 355,000 in Halifax Regional Municipality. organization. As GIS Technical Coordinator, you are responsible for the GIS database and GIS based applications for water, wastewater and stormwater as well as coordinating the work of technical staff. As a GIS Technical Coordinator, you bring to the role a minimum of five years related experience in GIS data management and analysis as well as experience in GIS updating. Your education includes a two year GIS Diploma or a University degree in a related discipline. Furthermore, you have received certified training in ArcGIS, relational databases and continue to progress in your knowledge and training related to current GIS technology (location based services, WebGIS, map server technology, mobile computing). As an ideal candidate, you have demonstrated your ability to provide high quality, detailed, technical expertise. You are also a self-starter who ideally has had previous supervisory experience. In addition to a collegial work environment that promotes a work-life balance, Halifax Water offers its employees a challenging and rewarding career with a competitive compensation and benefits package, opportunities for professional development, and incentive programs. As a member of the team at Halifax Water, you will be contributing to the success of the utility while delivering water, wastewater and stormwater services in an integrated, cost effective and environmentally sound manner with a commitment to long term sustainability. received by 12 noon on November 24, 2017 and may be forwarded via fax #490-6934 or email [email protected] or mailed to Halifax Water, Human Resources Department, P.O. Box 8388, RPO CSC, Halifax, N.S. B3K 5M1. Do you have past experience in GIS analysis and enjoy having database management responsibilities? Do you have general knowledge of water distribution and wastewater / stormwater collection systems? Do you take pride in producing high quality, detailed work in a steady paced environment? If so, this may be the opportunity for you! database administration, analysis and project leader in all areas of Geographic Information Systems (GIS) and GIS based systems at Halifax Water. possess an advanced GIS diploma or equivalent combination of training and work experience in GIS and database administration and a university degree (preferably in Geomatics, Geography, Engineering, Science or Computer Science). You also have obtained certified training in GIS and database administration and are willing to obtain certified training in OMM software within 6 months of hire; along with obtaining GIS Professional Certification within 1 year of being in the GIS Analyst role. the position through a set of practical applications. Completed applications/resumes, stating Competition #HW17-74E, must be received by 4:30 pm on November 15, 2017 and may be forwarded via email [email protected] or fax to 490-6934 or mailed to Halifax Water, Human Resources Department, P.O. Box 8388, RPO CSC, Halifax, N.S. B3K 5M1. Under the general direction of the Civic Addressing Administrator at the Nova Scotia Geomatics Centre, the Geographic Information System (GIS) Analyst leads and provides technical direction to a diverse team of GIS Specialists as well as contracted resources. The Analyst is a highly skilled geomatics professional who possesses the expertise and experience essential for taking a leadership role and oversees a host of technical projects related to the maintenance, quality control and improvement of the Province’s Corporate Nova Scotia Civic Address File to defined specifications and standards. The incumbent is an innovator in the application of GIS technologies, relational databases, geographic data analysis tools and methodologies, digital imagery, data collection, data conversion, technical documents and integration. The ideal candidate must continually investigate the latest geomatics advancements and trends in order to effectively manage and provide recommendations for the advancement of the civic address file. Are you trained in GIS, with experience in a utility field? Do you have general knowledge of water distribution and wastewater/stormwater collection systems? Do you take pride in producing high quality, detailed work in a steady paced environment? If so, this may be the opportunity for you! Halifax Water is seeking a 12 month term Engineering Information Technician (Level I or II) to join the Engineering and IS Department. The Engineering Information Technician will assist in the GIS maintenance, updating, retrieval, display and dissemination of record information in its many formats within Halifax Water as well as the production of engineering drawings and sketches. As an Engineering Information Technician, you bring at least one (1) year of experience, preferably in a utility environment, combined with a Diploma in GIS, CAD or equivalent program and related training and experience. Past work experience in a GIS environment, strong computer skills and general knowledge of water distribution and wastewater / stormwater collection systems are considered assets. As an ideal candidate, you demonstrate the ability to perform high quality, detailed work in a steady paced environment. For more information on this position, please view our website (www.halifaxwater.ca). Completed cover letters and resumes, stating Competition #HW17-17E, must be received by 12 noon on May 18, 2017 and may be forwarded via fax to 490-6934 or email [email protected] or mailed to Halifax Water, Human Resources Department, P.O. Box 8388, RPO CSC, Halifax, N.S. B3K 5M1. The Geomatics Association of Nova Scotia uses a tiered level sponsorship program. All levels of sponsorship help generate revenue necessary for the Association to operate but provide different benefits back to the company or organization in return for their generous support. Click here for more details on the different GANS sponsor levels and how you can become a GANS sponsor.